Classic Glass & Mirror has been tempering glass in-house since 2013! Our oversized tempering oven can accommodate glass up to 82” x 142”! Also known as safety glass, tempered glass is three to four times stronger than non-tempered (annealed) glass. 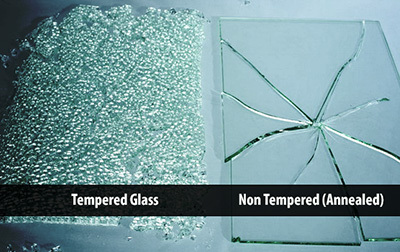 Unlike non-tempered glass which can shatter into jagged shards if broken, tempered glass fractures into small, relatively harmless pieces that are less likely to cause injury. Tempered glass is used in various applications such as shower doors, architectural doors, railings, table tops and vehicle windows. Since we temper our own products in-house, your made-to-order glass is shipped and handled less often, so our turnaround times are faster! And your glass is safer! If you are in the glass industry and need your glass tempered, we also welcome the opportunity to temper customer’s own glass. Please call our office for pricing.